If buying multiple flavors, be sure to specify the flavor you want for your free bag(s) under "Instructions to the Seller". Shipping is FREE for orders over $49, otherwise shipping is a flat rate of $2.99. All orders are shipped in 24-72 business hours (Monday-Friday) from Santa Clara, California. You will be notified by e-mail when your order is shipped. At this time, orders cannot be shipped outside USA. 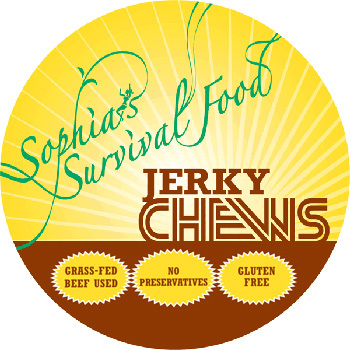 There are no preservatives in Jerky Chews besides a little salt, so it's important to treat the beef jerky as real food. Unopened bags do not require refrigeration. Store them away from sunlight in the pantry, or a cool, dry place. Once you open a bag, consume the jerky within the first day. Our new 8 oz bags come in thicker resealable bags, so you can enjoy an opened bag for longer. We recommend consuming the jerky within one week of opening and freezing if you plan to hold on to it for longer. Keeping an opened bag in an airtight container will help preserve freshness that whole week. We make clean ingredient beef jerky from hormone free,100% grass-fed beef. FREE of gluten, soy, dairy, artificial preservatives and refined sugar. Perfect for people following Paleo, 21 Day Sugar Detox, Low Carb, Whole 30 Approved. A great source of high protein for the outdoors and the gym, and anyone leading a busy on-the-go life. We cannot make returns on opened bags. If there is a quality issue, please contact us.